Tang Palace Hotel ha been adjudged the best '4-Star hotel of the year' National and Regional for maintaining high standards in service delivery. This was announced at the 2018 National Tourism Awards in Accra. 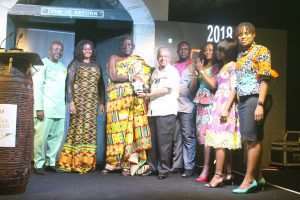 The citation accompanying the award paid glowing tribute to the Tang Palace hotel as ideally located in one of Accra's most sought after areas. It is also known for its excellent Hospitality facilities and services with impeccably groomed and friendly staff. It also acknowledged the indelible mark the hotel has made on the Ghanaian hospitality landscape since its opening. The General Manager of the hotel, Mr. Sajid Ali Khan who received the award on the hotel's behalf in an interview commended the organizers for acknowledging hard work in the industry and assured to safeguard and maintain the high service standards to promote the sector. She assured adding that novelty will be maintained in service delivery to promote Ghana's hospitality industry. The National Tourism Awards was instituted by the Ghana Tourism Authority (GTA) in 1997 to reward excellent performance in the tourism sector. It is one of the flagship events of the GTA held annually and it sets the tone for high standards in service delivery among practitioners in the tourism sector. Awards, including honorary awards, are presented to practitioners and organizations who have maintained high standards and individuals who have made immense contributions to the growth and development of Ghana's tourism industry.